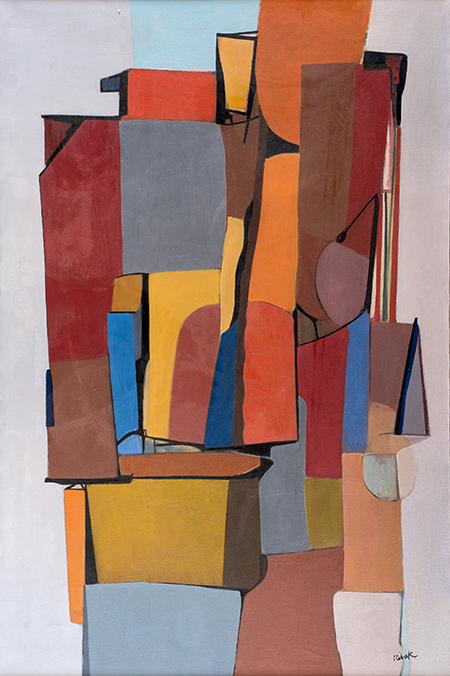 Louis Ribak, "Structures No. 13 Abstract," oil on canvas, 90 x 60"
Georgia O’Keeffe Museum and the New Mexico Museum of Art have mounted grand altars to New Mexico modernism this season, with radiating chapels in gallery spaces around town. It’s an autumn exhibition series called “Fall of Modernism”, a vaguely ironic title considering the exploding popularity of art shows and other projects that chronicle this golden age in local art history. From the O’Keeffe’s “Modernism Made in New Mexico” show early this year, to this month’s premiere of the Mark Gordon documentary “Awakening in Taos: The Mabel Dodge Luhan Story”, New Mexico’s 20th century avant-garde is having a moment. Addison Rowe offers the smoothest transition I’ve experienced from the modernist wonders of the “Fall of Modernism” museum shows to a smaller art space. Strong canvases by Louis Ribak, Raymond Jonson and Beatrice Mandelman overwhelm entire walls, and charming studies by big names like John Marin engage in witty dialog with works by local legends such as Victor Higgins and Jozef Bakos. The gallery's Victoria Addison points out connections between these New Mexico artists and their contemporaries in New York and other art centers: “I want these artists to find their proper status,” she says. That is, among Willem de Kooning, Richard Diebenkorn, Jackson Pollock, Josef Albers and the like. It’s easy to think of artists in a hierarchy of influence, from the famous to the obscure, but the modernists were such a tight-knit community that inspiration flowed in every direction. “The Many Faces of Modernism” fills in some of the gaps in an epic story. Prepare for revelations.